Aggregate piers are columns of compacted stone installed in groups in poor soil to increase bearing pressure and mitigate settlement under structural footings. They are a cost-effective method to reinforce soft, cohesive soil and poor fill for all types of structures. Aggregate piers are formed when lifts of stone are introduced to an open hole and compacted using high-energy densification equipment. The phrase aggregate piers may be used to describe either a rammed pier or a vibrated pier, also called a vibro stone column (VSC). The down-hole compactive device may be either a high-frequency vibratory probe or a vertical tamper. Each lift of stone or other granular material is compacted, forming a high modulus aggregate pier. The aggregate piers are designed and installed in groups to improve the ground’s ability to support structures. Installation has been proven on hundreds of projects with successful load test results and other post-treatment testing methods. The aggregate pier system is extremely effective to reinforce soft clays and silts or to significantly improve man-made fills. When installed with a down-hole vibratory probe, aggregate piers can also be used to improve loose, silty sands with a process called vibro-replacement. For loose, clean sands susceptible to liquefaction, the vibrating probes are used to densify the sand in a process called vibrocompaction. Installing aggregate piers is a relatively simple and straightforward process that follows five main steps. Using hydraulic crowd pressure, a hole is excavated by advancing the probe into the ground and displacing the soil laterally. If existing soils are stiff and/or contain large cobbles or other materials, pre-drilling or pre-loosening with an auger may be necessary. If the probe is used (in soft soil) to advance the hole, minimal to no spoils are generated. In this step, lifts are compacted using vibration and down pressure from the vibroflot. The compaction process continues until a high modulus column is complete. The soil type determines the different types of columns and methods used to feed stone into holes. In predominantly cohesive soils, we mount a hydraulically powered vibroflot to the ground improvement rig. This rig advances the vibroflot into the ground with significant down pressure, laterally displacing the soil and creating an open hole down to the design depth. In some cases, pre-drilling with a drill rig may be necessary to excavate the hole, particularly in stiff soils and/or soils with cobbles and large, miscellaneous fill particles. After excavating the hole, we then dump aggregate material from the ground surface into the hole in about one-to-two-foot lifts. The lifts are compacted with vibration and down pressure from the vibroflot. When soil conditions consist of unstable, fine-grained soils, such as silts and clays that may be below the water table, it may be necessary to bottom-feed the aggregate material, alleviating the possibility of hole collapse. With this technique, we attach a tremie to the vibroflot full-length, which is used to carry stone from a rig-mounted hopper to the bottom of the hole. As we raise the vibroflot, stone empties into the hole. The stone compacts in lifts in a continuous process until the vibro stone column is complete. The Wet Top Feed method of vibro stone column installation is required for deep treatment of unstable soils consisting of silts and silty sands, often below the water table. With this technique, we either suspend the vibroflot from a crane or mount on a rig. It is then lowered into the ground and penetrates the soil with the combined action of water jetting from the tip and vibration. After reaching the required depth, we reduce the water jetting volume until a small upward flow of water around the annulus of the vibroflot is observed. At this point, a small quantity of stone aggregate is introduced and the vibroflot is slightly lifted and lowered until the stone charge is fully compacted at the tip of the vibroflot. This action is repeated in one-to-two-foot lifts until the vibro stone column is formed to the surface. Although the process is “simple,” solid engineering, quality control, and acceptance testing are critical to a low-risk project. You want a contractor experienced with a wide variety of projects, both large and small, using not only this technique but the related techniques of vibrocompaction and deep foundation installations. 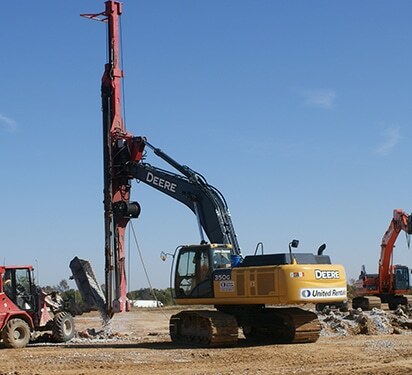 Subsurface Constructors has designed and installed aggregate piers for more than 500 projects. See some of our best work here.